Hello Charles, probably best to take the 10 FWY from La to the 15 FWY then north up through the Cajon pass and up into the desert and then look for Bear Valley road. 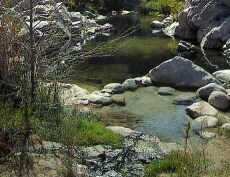 If you look under " Deep Creek Hot Springs " in yahoo.com you will find alot of sites with directions to the Bowen Ranch from Bear Valley Road and the 15 FWY. The many sites at yahoo can tell you pretty much anything you would want to know about DCHS.